Location: Killeshandra in County Cavan, Ireland. 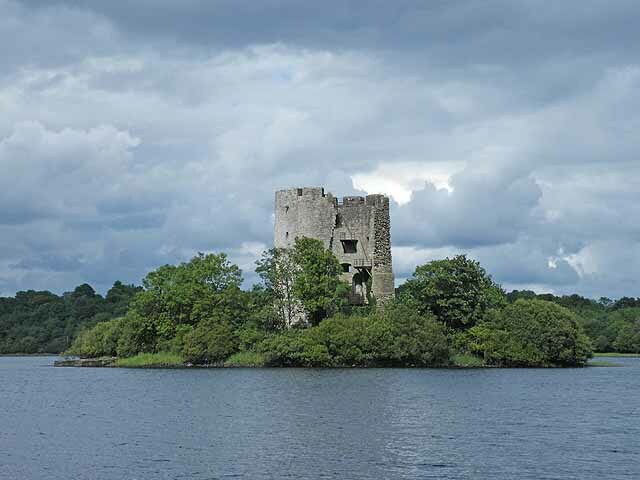 Notes: Cloughoughter Castle is a ruined circular castle, situated on a small island in Lough Oughter, 4 kilometres east of the town of Killeshandra in County Cavan, Ireland. The castle is located in the historic Kingdom of Breifne, specifically in the part that would later be subdivided into East Breifne, roughly corresponding to County Cavan. Prior to the construction of the castle, the spot may have been a crannog. In the latter part of the 12th century, it was under the control of the O'Rourkes, but it seems to have come into the hands of the Anglo-Norman William Gorm de Lacy after the Normans wrest control of some of the territory from that ruling clan. While the exact date construction began is unknown, it is estimated to have started in the first quarter of the 13th century. Architectural elements date the lower two storeys of cloughoughter to this time. In 1233, the O'Reilly clan took possession of the area and completed the castle. They retained it for centuries in the midst of their ongoing conflicts with the O'Rourkes and with members of their own clan. It was there that Philip O'Reilly was imprisoned in the 1360s with "no allowance save a sheaf of oats for day and night and a cup of water, so that he was compelled to drink his own urine. "Conservation efforts were begun on the castle in 1987.